Visitors to the Golden Gate Park may have noticed work going on to the side of the old camping and caravan area. These earthworks are not looking for any fresh dinosaur fossils, they are building a Dinosaur Center to showcase what has already been found in the million year old inland ocean which solidified into what has become known as the Clarens layer of rock, just above the Molteno layer. If you explore the area (go on a hike in the Park) you might find your own piece of history in among the sandstones and crystals that lie everywhere in the area. Imagine just a few million years ago, when this was a giant Dinosaur Park filling the entire Brandwater Basin. The development of a Dinosaur Center is long overdue, and we are all extremely happy with the way in which it is being made to blend into the beautiful surroundings of the park. The oldest known dinosaur nests have been found at the same South African park where scientists previously unearthed the oldest known dinosaur embryo (pictured), a new study says. Paleontologists recently found ten nests—each containing several tightly clustered eggs—in a nearly vertical cliff in Golden Gate Highlands National Park. Both the nests and the previously discovered embryo date back 190 million years. The new find shows that the region was an early Jurassic nesting site used by a plant-eater called Massospondylus carinatus. The site predates other known dino nesting grounds around the world by more than a hundred million years, scientists reported this week in the journal Proceedings of the National Academy of Sciences. After the ancient fossil embryo was described in 2005 (pictures), “we decided to go back to the original site and see if we [could] find embryos and nests in place in the rock wall,” said study co-author Robert Reisz, a vertebrate paleontologist at the University of Toronto in Mississauga. “THIS PROJECT HAS FASCINATED US SINCE WE FIRST WON THE COMPETITION. IT IS LIKELY TO START ON SITE IN 2015. 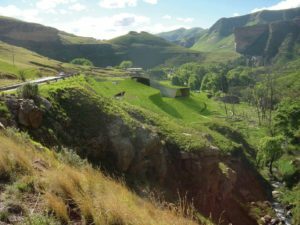 THE PROJECT WAS INITIATED BY SANPARKS AND IS DESIGNED TO HAVE A MINIMAL IMPACT ON THE BEAUTIFUL LANDSCAPE OF GOLDEN GATE. 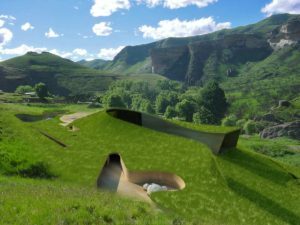 IT WILL BE BUILT ON THE ONLY DISTURBED GROUND IN THE VALLEY NEXT TO THE CAMPSITES AND WILL BE A VISITOR CENTRE THAT TELLS THE STORY OF THE DINOSAUR EGGS DISCOVERED RECENTLY WHEN THE ROAD WAS CUT THROUGH THE VALLEY. THESE ARE THE OLDEST KNOWN DINOSAUR NESTS IN THE WORLD, FOUND AT THE SAME PARK WHERE SCIENTISTS PREVIOUSLY UNEARTHED THE OLDEST KNOWN DINOSAUR EMBRYO. THE AREA IS FILLED WITH FOSSILS OF LARGE DINOSAURS IN THE SANDSTONE ROCK AND IS LIKELY TO BECOME A BUSY HOLIDAY STOP IN THE GOLDEN GATE PARK.